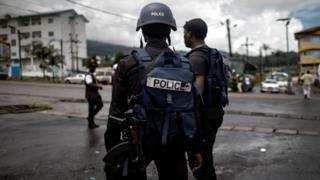 Rights group, Centre for Human Rights and Democracy for Africa, di call Francophones and Anglophones for Bangourain for calm down, stop hate speech afta attack from gunmen and villagers attack back. Na for number 23 day for December weh about 300 gunmen from Anglophone side enta villages for Bangourain, kill one pesin, burn-burn laik 80 houses kidnap 15 but later free dem. But e no bi clear which kain group attack Bangourain pipo and no bi de first taim weh deh di attack dis village. Na so pipo for Bangourain fire back for December 26, youths dem first komot for market say make Anglophones dem leave dia village. Den deh kill two pipo as deh attack, burn one pesin, drag one for back bensikin for inside de village. CHRDA Director, Felix Agbor Balla di call for Francophone and Anglophones for de area for calm dia tensions, stop hate speech and e condemn as deh drag die body for public. Abgor Balla di signal and say make goment take quick action for shiddon tok as hate crime, fight between tribes and brainwashing dey for air for seka dis cross boundary attack. Minister for Territorial Administration, Paul Atanga Nji don go Bangourain for give material, like zinc, mattress and oda tins for de pipo weh deh burn dia houses dem. Dis wan na afta governor for West region Fonka Awah Augustine bin don go sympathise with population wen de attack happen. Even political parties don put mop tok about de attack for Bangourain, main opposition party Social Democratic front go hold meeting and Cameroon Democratic Union don give tins for helep victims. Menzgold: "I invest Ghc760,000 all lock inside, if President Akufo-Addo no speak we go die"